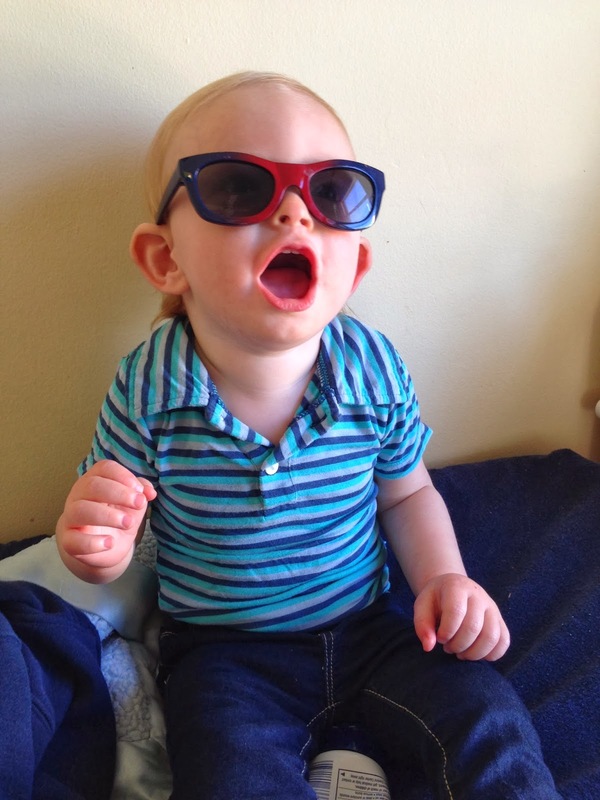 Doing his best Ray Charles impression. As I've discussed ad nauseam here on the ol' blog, I'm on a perpetual search for the perfect baby class that will both stimulate the Muffin Man and allow me to meet some other Mommas. After doing some research, I decided to sign us up for a music class. Noah loves music and playing his little xylophones here at home, so I figured a more structured class taught by an instructor who can actually sing on key would be a fun way to spend some time. I forked over an exorbitant amount of money - $250 for my kid to chew on a drumstick once a week - after which I proceeded to excitedly explain to Noah about the amazing music class we were going to attend and how much fun we would have. I had very high hopes when we showed up for our first class two weeks ago. In fact, my outlook was so positive that I even showered, put on some makeup, and managed to get us there a little bit early. Noah and I were the first duo to show up, so we settled in on our square of carpet and waited for class to begin. As the other students and their adult companions started to arrive, I began to notice that I was the only actual Mother attending class with her child. Every other baby was there with his or her nanny. I held out hope that maybe, just maybe, as it got closer to the actual start time of the class, a fellow harried and overwhelmed Mommy might arrive all in a fluster and that she would have a super awesome kid who Noah really liked and that she would be a kindred spirit and make the music class totally worthwhile. Sadly, this was not the case. There I sat, the only Mommy in a room full of Nannys who not only knew each other but with whom I am unable to communicate. Okay, I wasn't going to make any lifelong Mommy friends while also singing some weird made up pizza song, but I'm pretty much willing to put up with anything for the sake of my son's wellbeing, so I took a deep breath and decided to make the best of it. It's one thing to say that your child likes music and likes playing music while in the comfort of your own home, but I guess music in a small, echo-y room is not exactly akin to banging on a tambourine while sitting on the living room rug. The minute the teacher started hitting the drum or playing the guitar or basically making any noise above a whisper, Noah started crying. He was clinging to me, wailing in fear as all the other kids waved their shakers in the air and squealed in delight. My kid, on the other hand, wanted nothing more than to escape the madness. I tried dancing with him which usually calms him down despite my lack of rhythm, but to no avail. I attempted singing along and helping him clap his hands, which simply made him cry harder. He finally relaxed when I took him outside and sat quietly with him while watching the traffic go by. After he returned to his normal, chipper self, I attempted to take him back into the classroom, but upon seeing the entrance and hearing the strains of "The Saints Go Marching In", Noah practically clawed my eyes out trying to escape. Needless to say we spent the rest of the class sitting an a bench outside while Noah looked for fire trucks and I counted the ways in which I could've better spent $250.00. What an epic, epic baby (and Mommy) activity FAIL. Not surprisingly, the tuition is non-refundable, so I still have to take Noah to the class in the hopes that he will eventually begin to enjoy having a giant drum pounded right at his ear-level. Oh well, maybe I'll learn some Spanish since, thanks to the fact that I'm the only English-speaking attendee, the whole class is now conducted en espagnol. I'm so sorry you and NOah had this experience. However, I want to say, whethe ryou take himt o the class or not will not make a differnnce in the cost, which you already spent. If he truly doesn't like it and has a much more enjoyable time at home, I would not make him go there. Having spend that enormous amoutn of tuition and then having your child feel tortured is worse than having spent that enormous amoutn of money for nothing, I believe. Then again, I understand you wanting to try it a few more times to give him a chance to get used to it. Oh my heck! Sounds horrible! Totally a wee bit comical too :) Espanol! Craziness! Hope it gets better! Wow that is so horrible, I'm so sad that this happened to you. Personally, due to the fact that they're now conducting the class in Spanish and this was not told to you before I'd request a refund on that fact alone.